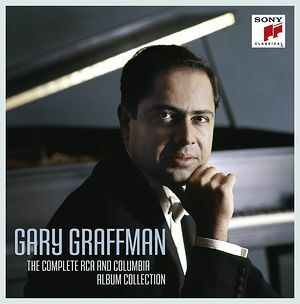 Sony Classical celebrates Gary Graffman American pianist, teacher of piano and music administrator with the first-ever release of Graffman's complete recordings in a 24 CDs limited original jacket collection. When RCA Red Seal released the first Graffman recordings in 1956 Schubert's "Wanderer" Fantasy and Prokofiev's Piano Sonatas Nos. 2 & 3 the pianist was 28 years old. Now, after more than 50 years, this debut recording is being released for the first time on CD, together with 13 more LPs worth of music, all newly remastered from the original analogue tapes. Included in Gary Graffman The Complete Album Collection are notable performances of Rachmaninov's Rhapsody on a Theme of Paganini (1964 with Leonard Bernstein and the New York Philharmonic), Prokofiev's Third Piano Concerto (1966 with George Szell and the Cleveland Orchestra), Mussorgsky's Pictures at an Exhibition, Prokofiev Piano Sonatas and one of the first recordings in the West of Tchaikovsky's Second and Third Piano Concertos (with Ormandy). His solo recital repertoire is represented by a generous selection of Brahms (including the Paganini Variations), Chopin, Liszt and Schumann (Carnaval and the Symphonic Etudes). There is also a reissue of what may be Graffman's most widely heard recorded performance George Gershwin's Rhapsody in Blue from the soundtrack of the 1979 Woody Allen movie Manhattan.